With a hundreds of women benefiting from Zardozi’s programs, a woman like Farida Sorabi not only uplifts herself but also opens her arms for more women to earn a kind of respect which they never had experienced before. Six years ago, Farida’s husband saw a back injury in a car accident and stopped working. Since he was the sole breadwinner of the family, their economic situation broke down and a lot of money was spent on his medical treatment. Farida was mentally affected by her husband’s sickness and overall home expenses. When she went to Pakistan for treatment, the doctors advised her to keep herself distracted with a suitable work. Upon return, Farida decided to enroll in a literacy course where she studied until 6th grade and learned to read and write a little bit. At the meanwhile, she also asked Ministry of Women Affairs for financial support. MOWA told her about Zardozi and subsequently shared her contact information with the office. In 2013 her life would take a different turn. Farida got introduced to business ideas in the Manbeh meetings, and gradually started to create her reputation for stitching and sewing good clothes. This gave Farida the courage to hire and train neighbors’ women who wished to learn tailoring from her. “More and more women urged to learn tailoring; therefore I had to build this large room. It wouldn’t be possible without Zardozi’s loan and my husband’s support,” says Farida. “Even this space is not enough. The business requires me to expand this place further to decrease the workload,” she added. Farida says that she always reminds her trainees about the lessons learned and risks in business. “I remember when one time I let down a customer and suffered a huge loss. I did not look at my trainees work and submitted the products without proper check,” recalled Farida. She also pushes them to work hard because she believes that there is no gain without struggle and sacrifice. What amazes us about Farida is her heartfelt sympathy and care for other disadvantaged women in her village. Farida advocates for the rights of poor women in her village when she visits her parents’ house. Most of the times, she visits her old neighbors and encourages their daughters to attend schools. She inspires them to work, and to become self-reliant. Farida says, “It hurts me to see women grieve in poverty and disrespect.” “I not only inform them about their rights but also show them different ways of helping themselves,” she added. Six years ago Farida is not the same person anymore. She has her own home, a car and good running business. Her room is full of appreciation and recognition letters from Afghanistan Chamber of Commerce & Industries (ACCI), and other organizations. Farida will be soon displaying her products in an international exhibition in Tashkent, Uzbekistan. This is not the first exhibition she attends. Farida Sorabi is the only client who has license from Afghanistan Investment Support Agency, and Municipality as well as the membership card of ACCI, which has allowed her to also participate in a lot of local exhibitions in different provinces of Afghanistan. It is with great pleasure to announce the addition of a highly qualified and capacitated woman to Zardozi family. We extend our warm welcome to Ms. Rahima Paiman, who recently filled in the position of Regional Manager in Kabul. We are happy to have our third female regional manager who will be a great asset in understanding and improving Afghan women’s lives through effective implementation of Zardozi programs. After receiving her Master’s Degree in Business Administration from Uludag University in Turkey, Ms. Rahima also comes with an extensive work experience with different organizations during her residence in Afghanistan. Ms. Paiman previously worked with Zardozi as Marketing Development Manager. She had always presented an impressive overview of her work and knowledge. She is passionate about delivering unsurpassed client services and led her team to provide excellent services to a big number of women in Kabul. Endeavoring to run a ‘women for women’ organization, bringing more women on board is a key part of Zardozi’s mission now. We are fortunate to have a well-deserving person filling this vital position. National ID card (NIC) is an indicator of an individual’s belonging to a country to prevent forgery, ensure electoral transparency and ease public access to various services such as education, medical care, and employment. Unfortunately, in Afghanistan, majority of the women are still denied this basic human right. According to Institute for War and Peace Reporting, 56 per cent of women do not have NICs. This number is high despite all the efforts of government and national and international organizations that provide public awareness about the benefits of attaining Tazkiras. Zardozi Kadars came to know the problem when women in Shewaki located in the South Eastern part of Kabul city, did not have identification cards to receive loans for their start-ups. When the Kadars asked the women to make Tazkiras, they saw a resistance by the male family members who did not deem it necessary for women to have NICs. Thirty-three years old Jamila who attends the Shewaki Manbeh said that she took her ID card when she was suffering from back pain and therefore had to travel to Pakistan. In order to travel, her family had to get her Tazkira. “Otherwise, I would never have one,” says Jamila. After discussing the problem with Kabul office, Zardozi Kadars decided to convince the families of the clients and spread awareness about the importance of National ID cards. Persuading men to unlock their women from social taboos is not as easy as the story is being told in words or the successes being achieved. Neither is being a Kadar easy to tackle societal problems. Kubra explains that it took two months to talk to families and go back and forth to their homes until they finally convinced their men. The men agreed only if the Kadars accompanied their women to get ID cards for them. Currently 22 clients of Zardozi have Tazkiras in Shewaki village. Some of them applied for Zardozi loans using their ID cards to start their businesses or buy the necessary equipment for expanding their work. “Self-belief and hard work will always earn you success”, believes 35 years old Nafisa- a mother of three daughters and three sons. Nafisa comes from Behsod district of Nangarhar province where she lives with her big family of ten people. Her husband is the only breadwinner, doing a small labor job which earns him 5000 AFS per month- not enough money to pay for all their bills. Joining Zardozi became a turning point for an ordinary tailor Nafisa where she first stepped out of the four walls of her home, faced difficulties and took up the challenge to shape her life in a better way. Among her other female friends, Nafisa grew her tailoring skills more rapidly. She bought two embroidering machines for her work. But to learn about its utilization she had to learn it from a professional tailor in the market. Nafisa took the challenge, learned to run the machines, and applied for Zardozi loan to activate solar system in her house in order to avoid electricity problems. Her work gradually attracted other male tailors in the market who signed contracts with her and referred their customers to her. With a big smile on her face and glitter of victory in her eyes, Nafisa says she showed her work to the tailor who had undermined women’s capability. “That sense of achievement was the best moment of my life,” she says. Nafisa’s cleverness, energy and enthusiasm also led her to become tailoring assistant (namely service provider) to Zardozi business trainer in the Community Business Center (Manbeh). On Manbeh days, she guides other women on their tailoring skills for which she is also paid some money by the organization. As part of Zardozi’s sustainability program, recognizing and hiring capacitated and diligent workers like Nafisa has helped the organization to sustain itself to some extent so that when there is no Zardozi, its operations will be still alive. Our objective is to create a cycle by empowering women with the right skills and self-confidence to run their societies and support other women. On December 11, 2018, Zardozi’s Executive Director, Ms. Homa Usmany represented Zardozi on the 16 Days of Activism against Gender-Based Violence (GBV) campaign organized by War Child Canada. Different national and international organizations such as World Bank, Relief International, GAC, and MoWA were invited to discuss about women rights, economic and social empowerment. During the panel discussion, Ms. Usmany spoke about her struggles and achievements as an Afghan woman, who challenged the male-dominated society and facilitated more opportunities for impoverished Afghan women to fight domestic violence and poverty. Ms. Homa Usmany stated that, “The challenges for women are universal, it might differ from context to context, but it is every woman’s story all around the world. As Afghan women we have to understand the context of our society, the sensitivity of our culture and the demands of our religion and if we understand these and set our own strategies accordingly, no one will dare to block our way to success.” “That’s how I manage my personal and professional life, and proceed with my work,” she added. Mahtab comes from Shalbafan of Heart where she lived with her husband and two daughters. However, her drug addicted husband led Mahtab to separate from him, because living with him had caused her a major economic drawback. Mahtab’s husband would even sell most of home appliances to buy opium. Once Mahtab decided to divorce him, her husband resisted to keep their children with him. Fearful of her husband’s bad habit which would leave a negative impact on the kids, Mahtab asked for help from her brother-in-law. He spoke with his brother and resolved the matter by giving the children back to her. 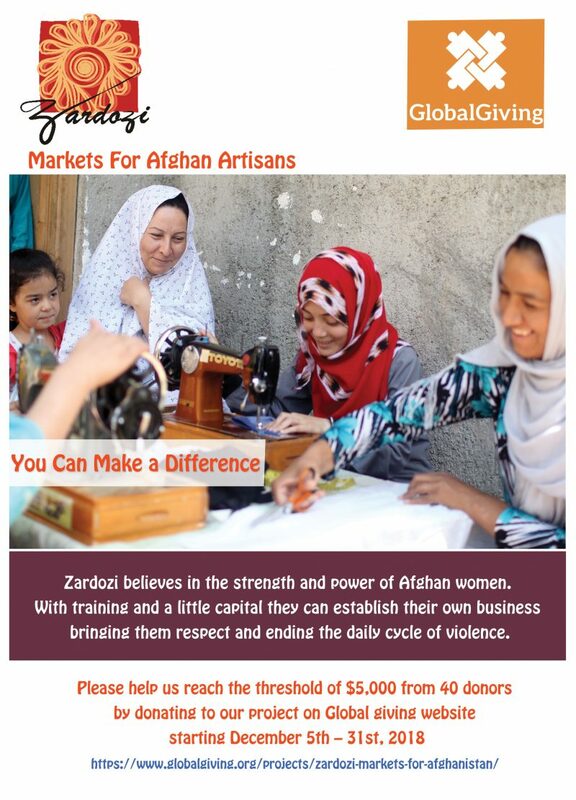 Mahtab learned about Zardozi’s work and attended some tailoring sessions. But, she could not extract much out of tailoring and the income could not cover all of her home’s bills and rents. The competition was high in the neighborhood while her income did not allow her to develop her business. She finally asked Zardozi to introduce her to an office or house which is safe for her to work as a cleaner. Getting the job at one of the offices, Mahtab started to earn enough to pay for majority of her expenses. She still sews clothes besides her full time job, when she needs more money. “Being a single parent is not easy. You have to protect yourself and children from all kinds of challenges which arise for women in Afghanistan,” said Mahtab. This winter, the Kadars, our volunteer members, have given us another opportunity to appreciate their work. They have once again helped their community to solve problems which otherwise would have been difficult without an influential person’s support and a collective effort of the village women. Recently, in a far-fetched district of Mazara-e-Sharif, a group of women discussed some of the difficulties they face in their society. They complained about damaged streets in one of the Manbeh meetings. These meetings are usually used for problem solving sessions as well. The rough and bumpy streets in the Ali Chopan District of Mazar-e-Sharif had made public transportation difficult during the winter season. The local people have lived with this problem for two winters but there has not been any government attention. The issue was finally brought up by the male leaders of the community. In order to accelerate the process, the men suggested channeling this issue through their women to Zardozi Volunteer Members. “The local people trust that we can do something, therefore they bring most of their problems to us,” said one of the Kadars. With the right network and expertise, Kadars brought up this issue to Citizen Charter in Mazar-e-Sharif. The Citizen Charter agreed to cover the cost by 70% and asked for 30% contribution from the people, which meant 10,000 AFN per each house. Because the poverty rate was high among the community members, they could not pay all at once. They proposed the possibility of four installments over an agreed period of time. The Kadars went to the Citizen Charter with the proposal and they have started the road construction based on the agreement. Today, 50% of the job has been completed while 50% more will be constructed in the start of spring. Mohammad Saleem, who is a resident of Ali Chopan, gave thanks to the Kadars. He acknowledged their services for the society and showed complete support for Zardozi’s work in the district. Kadars are Zardozi’s volunteer members who perform as Communication Bridge between Zardozi and Nisfe-Jahan’s offices. They are involved in the implementation of Zardozi’s programs, services and activities in the four regions. Zardozi provide several capacity building trainings including business administration to the Kadars in order to prepare them to become the building blocks of their societies and help community members particularly women to engage in civic activities. Currently Zardozi has four to five Volunteer Members in each region it operates. Ms. Hameeda, a mother of 5 children, struggled through the hardships of helping her drug addict husband to recover, and to support her kids to live a better life. Hameeda’s life upended when she got married. Her husband would spend all of the home savings on buying drugs. She didn’t have enough money to afford meals let alone providing her children health care and an education. In 2014, when Hameeda started her journey with Zardozi, her first aim was to admit her husband to a rehabilitation center and cure his drug addiction. “The only work that caught my eyes was tailoring. I thought I could excel my skills in this business area better. So I took some training and started to sew clothes for my neighbors and then slowly selling the clothes to near villages as well. I also received good orders from different shops with profitable prices,” says Hameeda. Looking at her business experiences, profitability and operations method, Hameeda took the risk to do some investment. She bought readymade cloths and sold them to her relatives and villagers. She was surprised at making her life’s biggest amount of money on her own. Hameeda also started to practice business the old way- exchanging clothes with goods. She says, “A lot of our people are poor; they could not afford my dresses. One day a friend asked me if she could exchange a dress for some fruits. This gave me an idea of selling my clothes both for cash and goods.” Bartering in her small village kept Hameeda’s business on track. 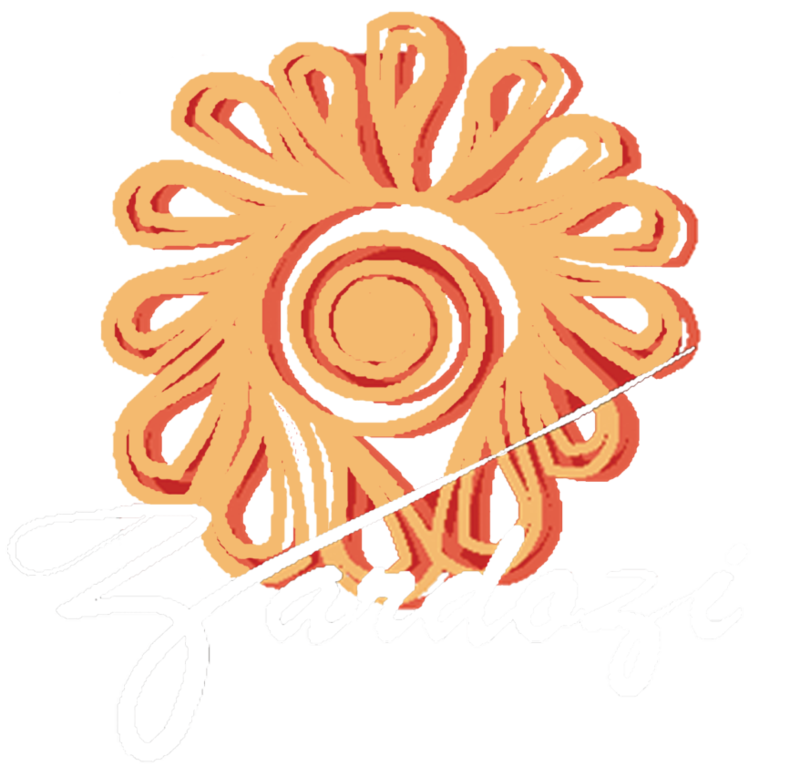 We’re delighted to inform you that Zardozi has been given an exciting new opportunity! On November 16, 2018, we submitted our project to the Global Giving Foundation who selected us to participate in its Accelerator – a fundraising opportunity for nonprofit organizations around the world. In order to succeed, we must raise $5,000 from 40 donors by December 31st, 2018 which will be the last day of Accelerator. If we meet this threshold, we will be permanently featured on Global Giving’s website, where we have the potential to benefit from corporate relationships, exposure to a new donor network, and access to dozens of online fundraising tools. Please help us achieve this target by donating and making your own contribution to bring a change in the lives of Afghan women. We will also need your help to spread the word! Please share this opportunity with your friends and family! “Zardozi took us out of darkness into light,” says 38 years old Zardozi client, standing in her booth at the exhibition as she repeatedly pass balls of dough through the Pasta machine thickening each dough to 2 mm and cutting it into 3 cm squares to make Ashak (an Afghan dish prepared on special occasions) – dumplings filled with leeks and sometimes meat. This is Nooria, a mother of two kids who found out about Zardozi five years ago when she was desperately looking for survival.